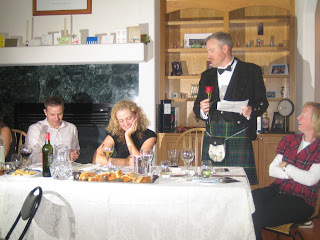 The Wilson Family: An American Burns Supper! 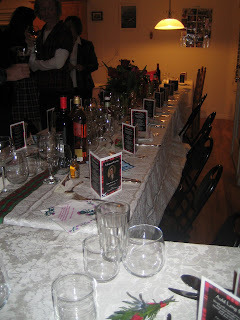 We had a great night on Saturday celebrating Burns night with a sit down Burns Supper for 25. I should have done a bit more preparation before hand but the night went brilliantly. 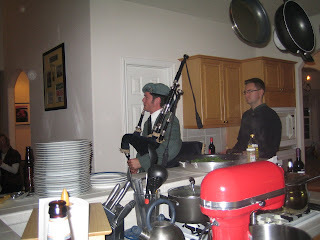 The Piper was very noisy and then changed to a quieter set of bagpipes to pipe the haggis in. There's a photo of Nick carrying the haggis. Everyone's speeches went well and there was even a proposal from John to Sheri. She said yes, thankfully, and champagne was enjoyed by all. I've included a photo of the proposal and one of the table. People eventually left about 1am and I was up with Jacob and Abi at 6.30am. We spent all of Sunday washing up and clearing and I am finally getting the house back to normal. I'll definitely do it again next year but will try and find haggis locally - it came from New York. The veggie haggis was lovely and I'm going to make it again soon. Loads of whiskey was drunk - not by me! Everyone left on a merry note. Jacob's parent conference went well. He's learning lots of new sight words and is getting on well with his writing. Abi had a written summary from her pre school teacher and it was glowing. Off down South this coming weekend to try skiing in Monarch. We're going with Nick and Amy and their little girl. Amy has offered to have the children so Allen and I can ski together which will be nice. 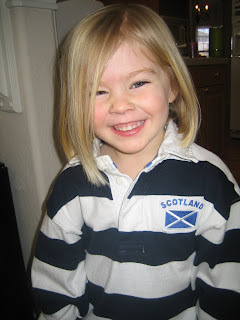 PS Accidently put one of Abi in in Jacob's Scottish rugby top!